July 20, 1831, Patent No. 6,631X. (The so-called "X patents" indicate patent records lost in the USPTO fire of 1836, so we can't see the original.) 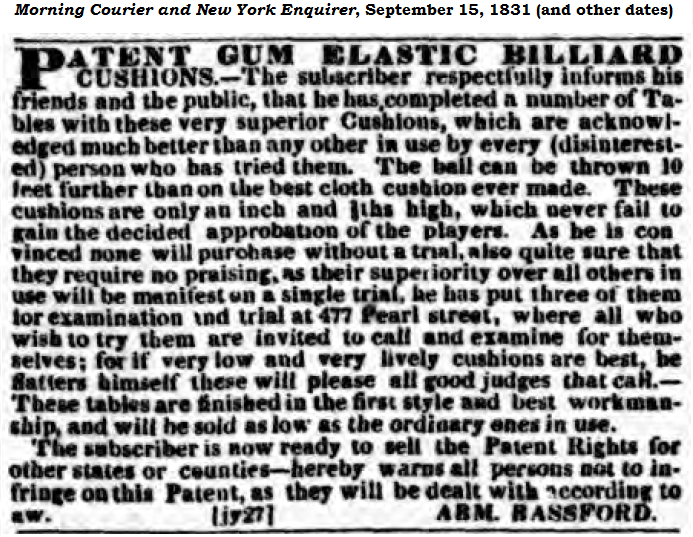 Click to enlarge his advertisement, and see how he described these cushions. Bassford was listed a turner, an ivory turner, and a musician in the 1820s, and his occupation became "billiards" in the 1830's. 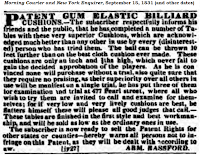 In the 1840's, Bassford had a foundry, and made billiard tables supported by gilded, cast iron eagles. Bassford also became a piano maker in the 1850s.